As promised - a preview and a, hrmm, post-view(?) of the homemade holidays! 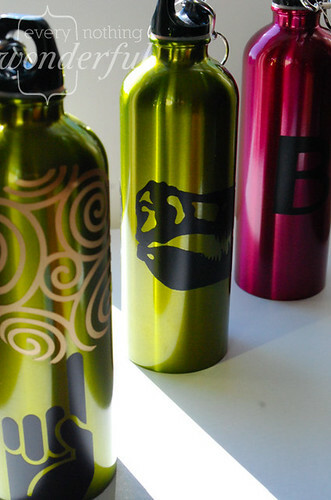 Custom water bottles for the nephews and mother in law - easy peasy to do with vinyl stick-ons from the craft store and a stainless steel water bottle. I combined two stick-ons for the soccer ball/hand version, put a dinosaur head on each side for the ferocious dino one, and kept it simple for the initial version. Not much to offer by way of a tutorial - just clean the surface with some rubbing alcohol, make sure it is good and dry and press on the vinyl stickers. Best of all the stickers were on sale at the craft store - made and saved! So, a little something from last year. Apologies in advance - I believe these photos were taken with my phone and I don't really have any close-ups or tutorial shots. 15 or so pieces of "coal"
For the scarf I used a piece of $0.32 remnant fleece cut in a strip. I then added a "fringe" to the ends by cutting upwards about an inch, at equal intervals, with pinking shears. That's it. For the nose and pieces of coal I used Model Magic because it is lightweight and I wanted to make sure the pieces weren't too heavy to fall out of their finished snowman. For the coal you simply use a piece of black model magic, roll it into a ball and then squish it a little with your fingers - just give it a thumb print squash or two - this makes a perfectly imperfect little rock. Put a stick of some sort in the back - a tongue depressor, round popsicle stick, or a found twig would all work fine. I dabbed mine in a bit of glue and then plunged it into the back - then let it all dry overnight. For the carrot I rolled a cone shape in white model magic and then made dents with a card from my wallet, added a crook to it, stuck in a stick, and let it dry. After it was dry I painted it with an orange acrylic paint a few times until I got the color I liked. All the coal and nose pieces were then given a few thick coats of Mod Podge to harden them and anchor the stick really well. Mod Podge, unfortunatley (in this case), is water soluble so I had to finish everything with a coating of an acrylic sealant. Not a big deal but best not to have everything fall apart when they get a little wet - and I wanted the boys to be able to use their snowman kit over and over again. There is an outdoor Mod Podge - which could eliminate a step easily, but I didn't find it locally or easily. If you can find it though it seems like a good option! That's it - put everything inside the hat and the snowman kit is complete. You could use a soft had and put everything in a box or, my original idea, see if you can fit things in a large mason jar. 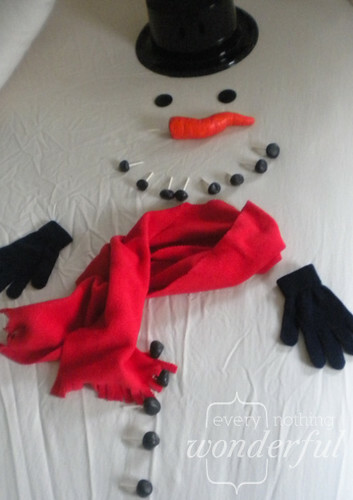 More homemade holiday ideas to come!